Netherlands Prime Minister Mark Rutte’s party held off populist Geert Wilders and his anti-European Union, anti-Islam party in Wednesday’s election, marking a major victory for the European establishment. The Dutch election was the first major test in 2017 for Europe where populist agendas are gaining support after the U.K’s decision to leave the EU and the U.S. election of Donald Trump. With record voter turnout, more than 80 percent of eligible Dutch voters cast ballots. Rutte’s People’s Party for Freedom and Democracy, or VVD Party, captured the largest share of the votes, earning 33 of 150 seats in the lower house of Parliament. Wilders’ Party for Freedom finished in second with 20 seats. “This is an evening in which the Netherlands, after Brexit and after the American elections, said ‘stop’ to the wrong kind of populism,” Rutte, who will serve a third term as prime minister, said in a victory speech. Rutte and the center-right VVD now begin the long process of forming a coalition government, which will likely exclude Wilders’ party. Earlier polls had suggested the Party of Freedom would become the ruling party in Dutch politics, but it lost popularity in the last weeks leading up to the election. Wilders nevertheless touted the group’s expanding influence. “We were the 3rd party in the Netherlands. We are now the 2nd party in the Netherlands. And next time we’ll be the No. 1!” Wilders tweeted. 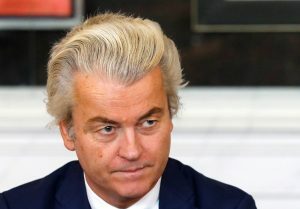 During the campaign, Wilders took a hardline stance against immigration and Islam, labeling the religion “an existential threat” to the Netherlands. He has also called for a ban on mosques and the Koran. To fend off the far-right’s growing support during campaign, Rutte adopted some of its more conservative views on immigration and assimilation. A recent diplomatic row between Turkey and the Netherlands helped Rutte by allowing him to take a strong stance against a majority Muslim nation and appease some on the right. France holds elections in April, with far-right candidate Marine Le Pen hoping to shake up that country. Germany faces federal elections in September, where Angela Merkel seeks a fourth term as chancellor.